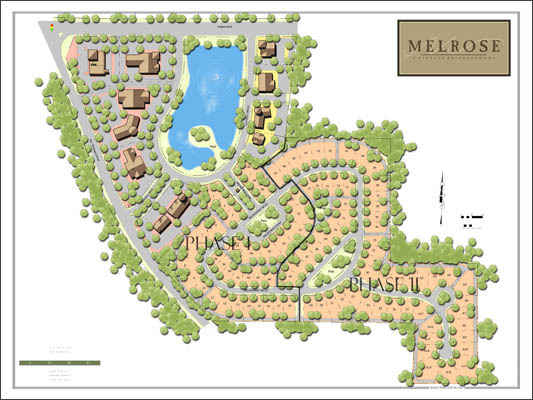 Melrose is a planned community situated on fifty-six acres near Montgomery, Alabama. The site is at the intersection of two major thoroughfares including a highly visible corner. The potential for the property to support commercial and office development as well as residential required a land plan that would give each a proper setting. The plan arranges three similar development areas around a central park and lake. The layout of the avenue allows businesses and offices to face the park instead of the major roads. This creates a pedestrian friendly environment that encourages residents and visitors to walk between destinations. A secondary loop road provides access to the residential community, which utilizes alleys for service and access. NLA assisted the Architect on the development of a pattern book for the residential community. The firm conceived the landscape guidelines for each lot type and the community as a whole.